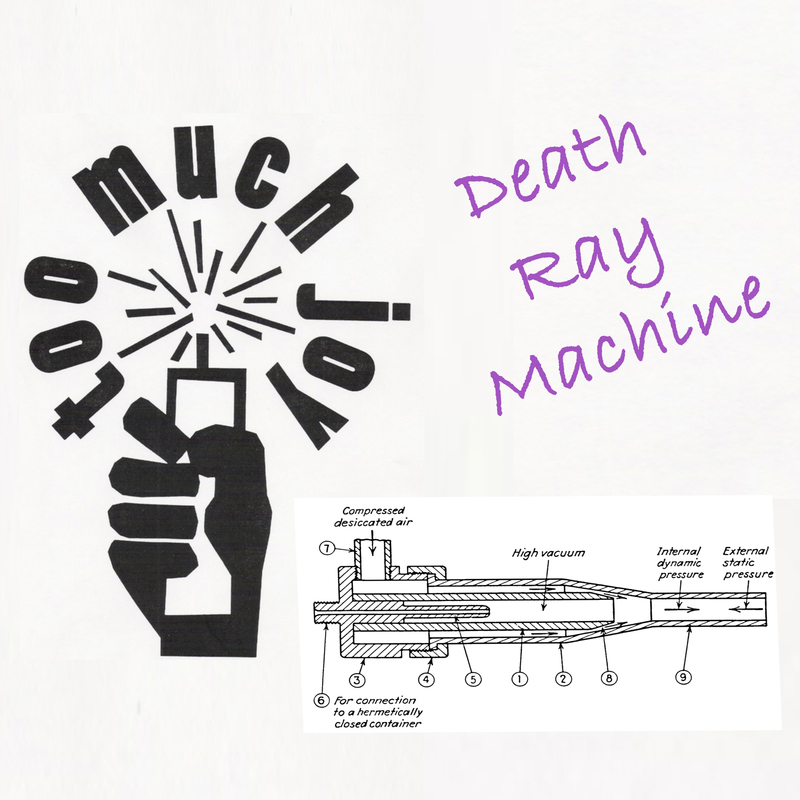 « New(ish) Too Much Joy! 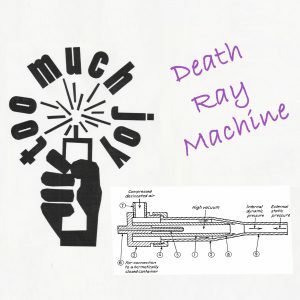 A couple months ago, Sandy was lamenting that the band had never really done justice to “Death Ray Machine,” a song we’d only ever recorded live to two track. Since Tim was going to be passing through NYC the following week, we decided to book some time in a studio and see if we could bang out a version that had the same energy as that live recording, but could finally be mixed properly. So that’s what we did. Matt Noble recorded the basic tracks in New York, Johannes Luley captured some more in Los Angeles, and, since we were harking back to olden times, our pal Michael James, who produced Son of Sam I Am, mixed everything together with his customary aplomb (you can follow his exploits on social media using the very descriptive hashtag, #MichaelJamesProducer). You can hear how it came out below (you can also buy it at Bandcamp, if you’d like to help us pay Michael James what he deserves, and/or persuade us we should do more of this type of thing). We’re so pleased with the results, we’ve been discussing what other songs we wrote but failed to record might benefit from a similar treatment. Here are four contenders. If you have a preference, let us know in the comments, or on our Facebook page. This entry was posted on Monday, March 18th, 2019 at 10:11 pm and is filed under Uncategorized. You can follow any responses to this entry through the RSS 2.0 feed. You can leave a response, or trackback from your own site. Guitarist/bassist/songwriter here. It’s not on the list, but I always thought “Making Fun of Bums” could be re-recorded. That there was a great song buried within a good one with this particular tune. TMJ should have it more like a Clash or Descendants song, re- do the snare sound, which is sonically inconsistent, especially noticeable in the “If I had a million dollars” stanza. Which is a disservice to Vinton, who is a grrat player. Also take out the music box keyboard playing G,A,B in the “Got a real cool poster section.” It’s over-produced and distracting. If you just have Jay’s gtr in that section, it would really pop. Do all 4….. just listened, and loved all 4 songs, ……. perfect criminal was not so good. Others fun, and I was very excited to hear. Of those four “candidates,” I’d say “Just Around the Bend” is clearly the best song. But it’s hard to fairly compare “Perfect Criminal” with the others because the audio quality is so bad. Not picking because anything you guys record, I’ll buy. Heading to Bandcamp now! I’m happy to hear anything you put out that makes you happy. So much of the Odds and Sods stuff, I’m used to the way they’re recorded, and that’s part of the charm. I’d love to hear Green Eggs and Crack remastered, but not necessarily re-recorded. But if I were forced to choose one of those four, I’d go for “Hey Merlin”. I was always a big fan of “Perfect Criminal” when you played it live, perhaps because it was such an outlier for TMJ. I mean, you guys didn’t do dance music and yet here was a fantastic song with both a galloping, rolling beat and a chord structure that were, shall we say, “inspired by” B.A.D,’s “Change of Atmosphere.” That said, you made them distinctly your own and I’d love to hear TMJ take that resulting “90s Manchester on speed” vibe to the logical conclusion in the studio. I’m really digging “Hey Merlin” and “Just Around the Bend”. Good to hear Sandy’s backing vocals again. William was fine, but it just wasn’t the same. It would be cool to hear “Train in Vain” re-recorded with full band. ‘Just Around the Bend” is my vote. I could imagine driving too fast to that one.